4275-020 Thruline RF Signal Sampler. Variable RF Signal Sampler. 20 to 1000 MHz, 1 kW max. The Model 4275 is a stand alone wide-range THRULINE RF coupling probe for spectrum analysis, RF signal observation on a scope, or frequency counting and control. It features a very low VSWR over a broad frequency and attenuation range. Insertion loss is a negligible 0.1 dB. The 4275 produces an unrectified, non-directional sample at the BNC port that is adjustable. Once adjusted, the setting can be locked in place. The main power connectors are Bird QC type N(M)s to N(F). The Coaxial Dynamics 87000 series X-Tractors are directional RF Signal Sampler Elements designed to permit easy coupling into a coaxial line for counting of frequency, spectrum analysis or scope display. The Directional X-Tractors are transparent to RF signals by virtue of their extremely low VSWR and Insertion Loss. Power levels of up to 100 kW can be sampled for frequencies between 50 and 500 MHz. Fixed attenuation values are available ranging from 37.5 to 70 dB. The X-Tractors comes with a BNC Female connector for the RF output and may be used in conjunction with the Model 81000-A and other RF Wattmeters, its own auxiliary line section (Model 88536), or any standard 7/8" through 6-1/8" line section. Fully Compatible with Bird 43 series wattmters. 4273-020 Thruline RF Signal Sampler. 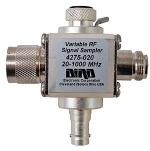 Variable RF Signal Sampler. 1.5 to 35 MHz, 5 kw max. The Model 4273 is a stand alone wide-range THRULINE RF coupling probe for spectrum analysis, RF signal observation on a scope, or frequency counting and control. It features a very low VSWR over a broad frequency and attenuation range. Insertion loss is a negligible 0.1 dB. The 4273 produces an unrectified, non-directional sample at the BNC port that is adjustable. Once adjusted, the setting can be locked in place. The main power connectors are Bird QC type N(M) to N(F) standard, others available. Three Week Delivery on This Product. 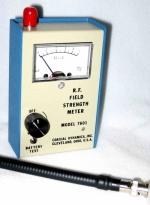 40 dB Sampling port for Model 43 style wattmeters. Plugs into the element slot. 1000 Watts maximum power. Used good condition. Same size as elements and has a BNC female connector for RF output. Bi-directional, Rrotate with arrow to see reflected RF level. Similar to picture shown except has an arrow for coupling direction.